Physics Buzz: Do White LEDs Disrupt our Biological Clocks? The realization of the body's special sensitivity to blue light has spurred scientific investigations of whether the light can disrupt our circadian rhythms, the roughly 24-hour cycle in animals that sets the body's patterns for sleep and other biological processes. While organizations such as the International Dark-Sky Association urge caution on using white LEDs for outdoor nighttime lighting and some scientists are already calling for regulations to ban the outdoor use of blue-rich light, others estimate that the effects are small and caution that more rigorous scientific studies are needed before determining if white LED light has any health impacts at all. Some scientists argue that other factors, such as sleep deprivation and abnormalities in a person's overall 24-hour pattern of exposure to light and dark, may do much more to disrupt circadian rhythms. Epidemiological studies have linked circadian disruptions to health problems, such as cancer, cardiovascular disease, and obesity, and scientists are trying to determine if light at night -- and blue-rich LEDs -- are a cause. Abraham Haim of the University of Haifa in Israel considers white LEDs a form of "light pollution." "What is called 'friendly' environmental illumination is unfriendly," said Haim, who is a chronobiologist, a scientist who studies biological rhythms and cycles in animals. He has conducted studies showing that blue light can disrupt circadian-related hormones in nocturnal animals such as voles, moles and rats. In the most common design, white LEDs create a mixture of blue and yellow light that the eye sees as white. Other light bulb varieties, including incandescents and compact fluorescents, tend to produce much less blue. Until the 21st century, scientists only knew of two types of light-sensitive cells in the eye: rods and cones. But in 2001, David Berson from Brown University established that the eyes of mammals contain a third type of cell for absorbing light. "This has been a very exciting discovery in the whole world of chronobiology and vision research," said Jay Neitz, a professor of ophthalmology at the University of Washington in Seattle. "We always thought rods and cones were responsible for circadian rhythms and then we find there’s a particular cell that [sends signals] to the superchiasmatic nucleus, the brain's central clock important for daily biological rhythms." The recently discovered type of cell, called intrinsically photosensitive retinal ganglion cells, are much smaller in number than other light-sensitive cells -- approximately only one of them for every million cones. But they contain a key light-sensitive protein called melanopsin. When light strikes melanopsin, it can trigger the ganglion cells to send signals to the superchiasmatic nucleus, a small brain region that regulates the body's circadian rhythms. The newly discovered ganglion cells "play the central role" in sending signals from the retina to the brain's circadian system, said Mark Rea, director of the Lighting Research Center at Rensselaer Polytechnic Institute in Troy, N.Y. As it turns out, melanopsin proteins are most sensitive to light in the wavelength range between 440 and 460 nanometers -- in between indigo and blue. 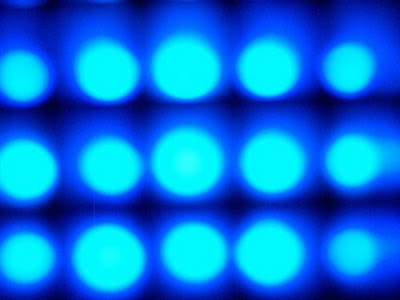 Many white LED designs create blue light centered at around 450 nm. A 2005 study by chronobiologists in Basel, Switzerland showed that human volunteers exposed for two hours to 460 nm light at night experienced greater reductions in melatonin, a hormone regulated by the body’s circadian system, than when they were exposed to a roughly yellow-green light with a higher-wavelength of 550 nm. Melatonin, in addition to helping the body maintain a regular 24-hour rhythm of wakefulness and sleep, is an antioxidant compound that has been shown to protect biological molecules such as DNA. In the Oct. 2011 issue of the Journal of Environmental Management, Haim of the University of Haifa and his co-authors calculate that white LED light can reduce melatonin levels five times more than low-pressure sodium lamps, which produce yellow-orange colored lights often seen in parking lots. Haim and his co-authors call for a "total ban of the outdoor emission of light at wavelengths shorter than 540 nm" -- and to go back to older low-pressure sodium lamp designs -- "to reduce the effects of decreased melatonin production and circadian rhythm disruption in humans and animals." They also call for increased consumer awareness and for bulb producers to state the wavelengths of light produced by their bulbs. However, Rea said that it is important to find out the absolute amount of melatonin reduction, instead of the relative amount, caused by different types of lighting. Five times greater than a small amount may not be great, he said. In addition, he argued, simple calculations based on the spectrum of the light may not accurately determine melatonin reduction. Instead one must take into account other factors, such as the amount, source and duration of exposure to the light, as well as how directly it reaches the observer. "All this stuff matters in terms of predicting what effect you’re going to have," he said. Haim is aware of these factors and his team would like to follow up with controlled studies that account for them. Meanwhile, Rea and his colleagues are pursuing research on this topic from two angles. First, they have developed a headset to measure light reaching the eye in human subjects over a 24-hour period. They call it the Daysimeter. Measuring the light that actually reaches the eye with calibrated instruments, he said, will be a key next step in getting answers on the effect of light on health problems. In addition, Rea and colleagues have developed a physiological model of how light reaching the retina is converted into nerve signals that reach the circadian system. Previous research has established that the degree to which nerve signals stimulate the circadian system determines how much melatonin is reduced. The model accounts for the sensitivity to the eye to different parts of the visible-light spectrum, and the level of light that triggers a signal to various parts of the brain. A brief flash of lightning does not trigger a signal to the circadian system, but a longer exposure to light would. Applying this model to a hypothetical person under a white LED streetlight for one hour, Rea and colleagues calculate that one hour of exposure can reduce melatonin levels by about 3 to 8 percent. "A 3 to 8 percent effect on modeling is small but maybe it does matter. I think the science just isn't there yet," he said. Similar model-based calculations by his group show that light from computer screens and electronic devices such as tablets can reduce melatonin by 7 to 20 percent. For perspective, Rea offered another example not involving white LED light. He fitted a colleague with a light measurement device when she attended a live hockey game. According to their model’s calculations, this suppressed 20 to 25 percent of her melatonin production. "But it's not like suppressing to zero," he said, "like you're getting rid of all your melatonin and you go out and look out the window and the streetlight and all of a sudden [you] don't have any melatonin for the rest of the night. That's just not true. So you really have to know the numbers." Rea believes that looking at light at night alone won’t answer fundamental questions about how the environment can affect the biological clock. "You find you can’t really talk about light at night without also knowing what you’ve got during the daytime. Taking into account the full 24 hour rhythm is essential," said Rea. "It's just too shallow to talk about melatonin suppression by 3 to 8 percent and draw any conclusions about what is going to be healthy or not healthy." Haim calls for more detailed epidemiological studies that explore relationships between nighttime light and health problems, by following large populations over long periods of time. Rea suggests moving beyond epidemiology. He suggests making detailed measurements of people's actual 24-hour light exposure and then designing experiments that create similar light-dark patterns for animals. Then, he said, you could test the hypothesis of whether the light-dark pattern causes health effects. And there are technological solutions. Wendy Davis, a vision scientist at the National Institute of Standards and Technology, said that it is possible with LED technology to create "tunable" light, so that it would produce blue-rich light during the day and blue-poor at night. But whether this will be necessary remains to be seen. "There is not enough research in circadian disruption to have a position other than we support good, intelligent, properly executed research, and when it's done, we'll review it and see if we need to change anything or what needs to be done," said Alex Boesenberg, manager of regulatory affairs at the National Electrical Manufacturers Association. Haim said that decisions on indoor and outdoor lighting "must follow chronobiological ideas," and not ignore the biology of humans, wildlife, and other animals. He calls for more studies of animal models that would look for biological effects of light. Absent definite answers at this point, Rea advised that people keep a fairly consistent 24-hour schedule when possible, which may be the safest way to keep the circadian system in a regular rhythm and not contribute to any possible adverse health effects.